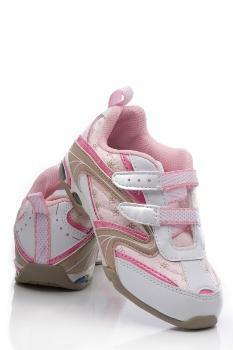 Kids pink shoes with white Velcro are a popular choice for toddlers and young girls. With their feminine and girly charm, and added ease of closure, pink Velcro shoes are a great year-round option. There are plenty of cheap tennis shoe options that make changing foot sizes both affordable and stylish. While young tots may not need the same friction and durability as an older child, their comfort should still be considered. When infants make the change from slip on booties to their first pair of walking shoes, Velcro closures are a fabulous option that makes getting dressed a hands-on skill that they can master with little difficulty. Although some parents feel introducing laces at a young age helps teach children how to tie their shoes, chances are most tots won't be interested in the skill until they near three years of age. Bridging the gap between tying laces is made easier and more convenient with the introduction of a Velcro closed shoe. Young tots can master a Velcro closure with ease, increasing their confidence and skill building. For older children, Velcro shoes are a trendy choice that have no end in sight. For busy kids on the go, a Velcro closure is a popular choice. Between playing outside and settling into quiet time, Velcro shoes make life a bit easier for active kids, and there are several versions of Velcro shoes that also add to their appeal. Here's a look at some of the varied trends in Velcro shoes. Velcro, although basic in function, doesn't have to be basic in style. There are many trends in Velcro footwear perfect for the young fashionista! Double closure: The most popular Velcro style is a double clasp closure that secures the lower and middle top of the foot. This option provides stable wear and blends comfort with classic style. Triple closure: Popular amongst the hip hop and urban scene, triple closures add cool street style to a basic shoe design. Faux laces: Faux shoelaces are a new trend in Velcro footwear. Adding the look of laces with the ease of Velcro closure make this a great option for those seeking the best of both worlds! Light up: For the gal that craves all the bells and whistles, look no further than light up tennis shoes! Light up shoes make getting dressed fun. Most light up shoes work their best at night, and keep in mind their purpose is only for novelty, not for safety. Musical shoes: For the toe-tapping fashionista, musical shoes are another option. This novel shoe idea can quickly tire, so make sure children wear them in an appropriate environment. Quite places such as schools, libraries, and churches may not be the best place to wear this form of shoe. On the other hand, in busy places such as shopping malls and parks, musical shoes may help you keep tabs on a wandering tot. Character: In addition to basic kids pink shoes with white Velcro, characters such as Barbie and Disney princesses can be found on ultra feminine versions of active wear shoes. These princess varieties are sure to appeal to little girls who crave their enchanting details. Pink shoes can dress up any outfit, and blend well with most pastel clothing choices. Perfect for spring and summertime wear, this girly shoe choice is perennially popular and made even more functional when paired with the ease of Velcro! There are many exciting new trends in the Velcro athletic shoe department. Seek out a pair of sequins for the flashy and glamorous girl, or stay playful with a pink shoe paired with polka dots. Rather than stick with a pair of boring whitewalls, why not test out the frilly trend and spoil your little tot with a girly variety?